Our cubicle panel extenders don’t just make employees happy by increasing their level of workplace privacy. 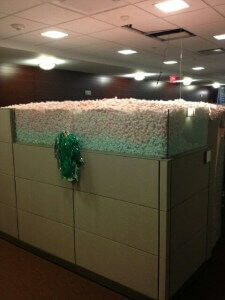 One unintended side effect can be making office pranks more fun. Twitter user PaulPabst posts a clever photo that clearly demonstrates the simple physics of the equation: you can fit more packing peanuts in a cube that has higher walls. More surface area and volume capacity means you can take your fun and harmless pranks a little further. Of course, the interior of the cubicle can be better shielded by opaque panel extenders rather than the transparent ones in the photo. That means your “victim” won’t be able to see inside the cube from a distance. You can get the full effect of the surprise when they round the corner and peek into their workspace to find that you set all their office supplies in Jell-O!